The Great Desert Rift was the gateway to the Terran Empire. From 3565 to 3598 Grand Alliance forces struggled with the Cybernetics for control of the region. Maintaining supply routes and lines of communication were challenging for both sides. The Terran High Command coordinated the allied forces. Admiral Benjamin Andropov, overall commander, skillfully deployed allied forces to delay the cyber advance while fresh units were raised and the newly allied Hosan Obelisk and Pizcivour empires moved forces into the Rift. By 3572, Cybernetic fleets had managed to drive their enemies to the edge of the Quattarin Constellations before Grand Alliance forces started their offensive. In early 3574, Hosanii shock troops led dropship assaults on Cyber occupied worlds all along the front. Geddan and KMR forces battled fiercely for frontier systems and planets but their lines of supply were long and poorly defended. Terran stealth ships ranged deep into Cyber territory to strike at the supply vessels strung out along these supply routes. Cybernetic commanders recognized the danger posed by the allied offensive and in late 3580, they ordered a general retreat to the Foran Nebula systems located at the midpoint of the Great Desert Rift. The Terrans and their allies followed hard upon the Cyber’s heels, cutting off and destroying stragglers whenever they could. The situation on other fronts was not as favorable for the biological races, whether part of the Grand Alliance or not. In the upper reaches, thirteen civilizations had been exterminated by Cybernetic forces, including the famed Calla Cooperative and the Presian Empire. The Borthan and its allies in the Viniculum were fighting desperately to stem the cybernetic tide while simultaneously fighting a brush war with “Wulf” forces of The Pack empire. In the lower reaches, the Rutak had suffered a major defeat at Berinolanska Nebula and were in full retreat all along their battle line. They had suffered nearly 20 billion combatants dead or harvested and an innumerable number of civilian losses. The fighting in the Great Desert Rift left thousands of derelict starships and abandoned outposts for players to explore and utilize. The fighting in other areas of the galaxy left behind treasures and dangerous technologies that are waiting to be discovered. 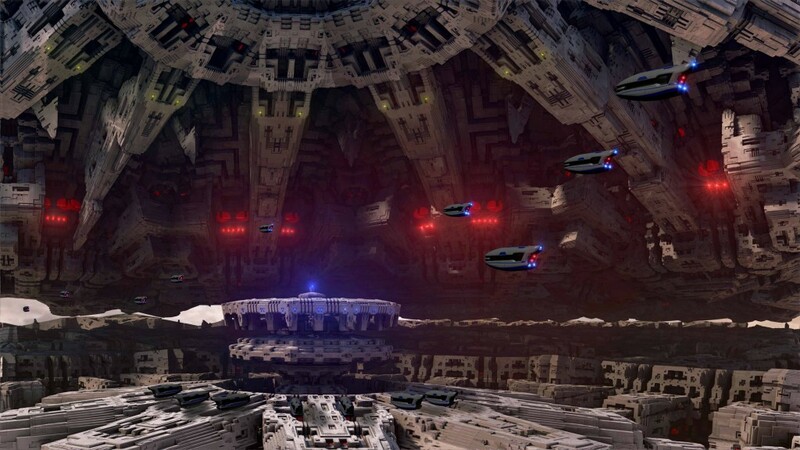 Migrant ships leaving Haderick Starport during the evacuation of The Borthan Angia starsystem in 3517.